If planting a tree is difficult then buying one is not easy either. I was to discover this last Sunday. Being day off I wanted to read some book but snuggler coaxed me in to taking her for a shopping spree, only to buy some plants. Dillydallying would not work this time, I was assured as she had been wanting to buy plants for quite sometime. So with cash loaded in to my wallet we went to a nursery of plants only to be surprised by the wide variety of vegetation and flora on sale. Before you read any further I must confess, my knowledge of plants is just as scarce or abundant as that of a third grader. The wife however, told me she had been researching on them over the Internet. So I assumed she obviously knew more. She: I want this one. How much is it? She: Hmm, is it a good plant? I want that one too. How much is it? He: Yes it is very good. That one is for Rs. 1400. By now the bloke had sensed that the lady he was dealing with knew nothing about plants. He: It is a new plant. She: Ok. I want this one too. He: Without waiting for her to ask the price, he said, “500”. It is a beautiful plant, fully grown and healthy. He: Yes maam. They all have very long lives. Just give them water and some hoeing will do. She: Hmm. I want some small plants also. You have any? He: Yes maam. This way. She: I want this one, and that one and that. He: They are all 100 each. She: Ok, I will have five of them, each. I sensed now it was time to intervene this commercial conversation. Very politely, pointing to a small plant I asked snuggler in a hushed tone. Do you know what this is? She: This is a plant too. Assuming the other ones to be plants too I rested my case and preferred not to ask anymore questions. I could have named them PLant A, PLant B and Plant C. And I don’t have an iota of doubt she would have preferred Plant 1, 2 and 3. The man dutifully placed them in my car’s boot, spilled a lot of earth and got paid for it. Next “she” wanted to buy some pots. So we went to a nursery that had hordes of pots of various sizes and shapes displayed in a but decrepit shop of sorts. She: I want pots for plants. He: Yes we have them. She: How much is this one? He: Prices have gone up. He: Yes baji, I will sell them for 60. She: I want eight of these. Don’t you have any plastic pots? He: No baji. 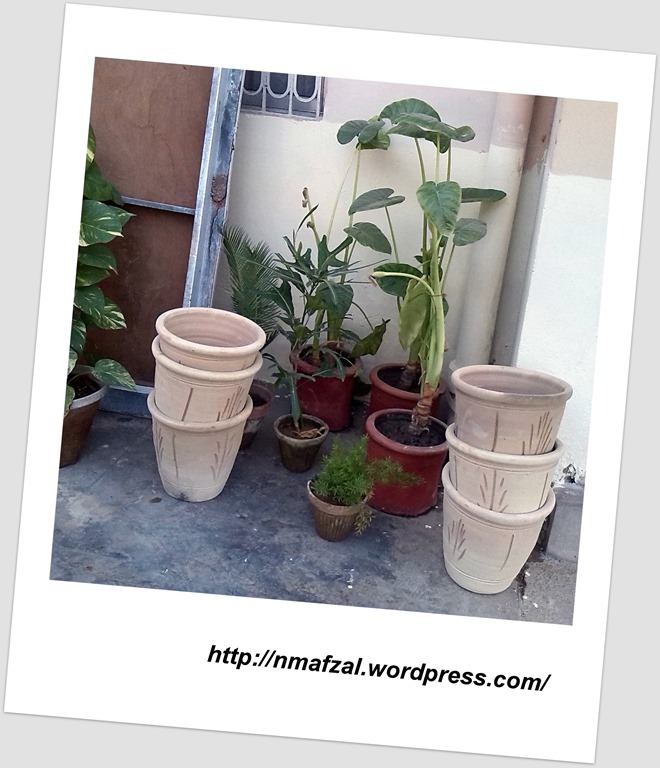 We only have earthen pots. She: Ok, please place them in the car. While the poor bloke complied. She saw some more of them earthen pots. She: How much is this one? And this and this? He: 60, 50 and 100 rupees. She: Ok, give me two fifty wallas, two 60 wallas and two 100 wallas. She: And I don’t want the ones you gave me just now. Please take them out of the car and put these instead. Plants and pots dexterously placed in the boot I paid the man his due. We were about to leave when she laid her eyes on some other pots. She: “Wait”, I like these. Me and the salesman gathered around them as if inspecting some marvelous creation of nature. She: How much do they cost? He: Fresh lot. The same ones which I removed from your car just now. She: But you said you will give them for 60. He: Yes, I will give for 60. Now there ensued enough confusion. With me and the salesman being the confused ones. Will she buy the same ones again (which she had bought and got replaced) or the ones she had just bought? There was abject silence during which glances moved from one person to the second and the third, and amongst each other. Finally Providence interceded and snuggler decided not to buy them. I hopped in the car, turned on the music at full blast and sped off before she decided to change her mind, yet one more time.